For Christmas, I bought my husband a 1000 piece puzzle thinking we could while away the remainder of winter putting it together. Long story short, there was a missing piece. 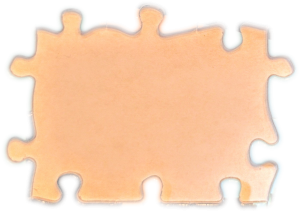 One single, solid orange missing piece. We called the manufacturer and they asked us to identify the row and column of the missing piece. It all seemed so easy, so smooth. Filled with hope we waited for an envelope to arrive with our missing piece. Instead, we received a box with another complete puzzle. Great. 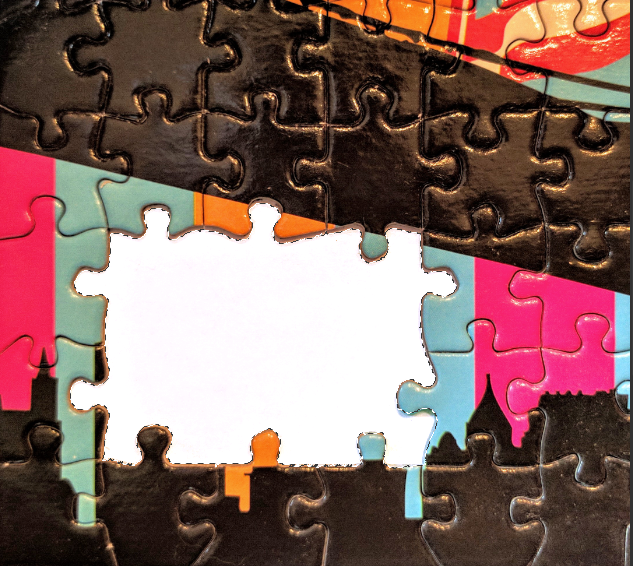 After at least 6 separate attempts at sorting pieces, we came to the conclusion that indeed the same piece was missing from this puzzle, too. “Don’t you have a machine that cuts things?” he asked. Duh! So, I was tasked to fix this problem. I was also reminded a few times… During various phases of procrastination, the project scope changed and a few additional pieces were removed and would be replaced with a solid piece that upon which we could sign our names. A six-piece gap to fill. 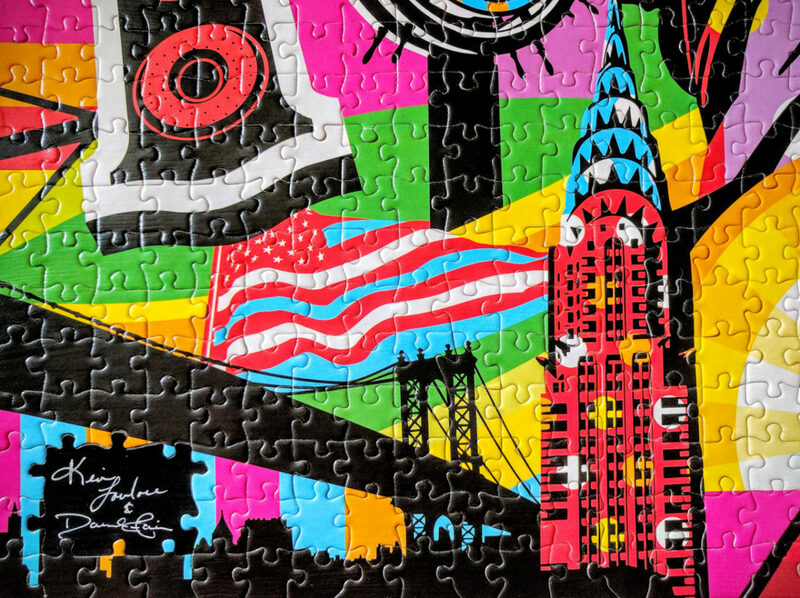 Instead of one little puzzle piece, it’s now one big puzzle piece. Sure. Once it was done, I was awash in a wave of guilt for not completing it sooner because it was so dang easy! 1. Place a piece of white paper under the missing piece(s) and take a photo of the area. Keep your camera parallel to the surface and your image as square as possible to minimize distortion. 2. 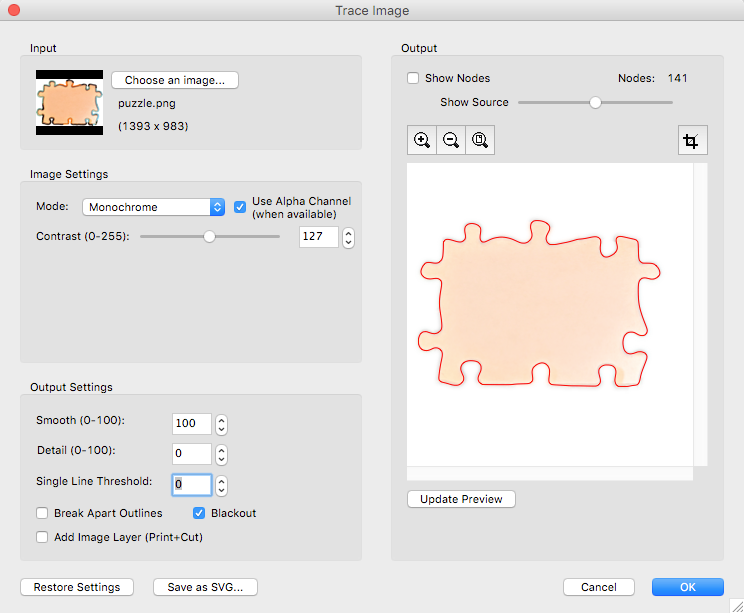 Open your photo in a graphics editor and use the Magic Wand tool to select the blank area. Refine the selection if necessary. 3. Copy and Paste the selection to a new document, then Save it as a PNG or JPG file. You should end up with something like this. I altered the color to make it easier to see. 4. 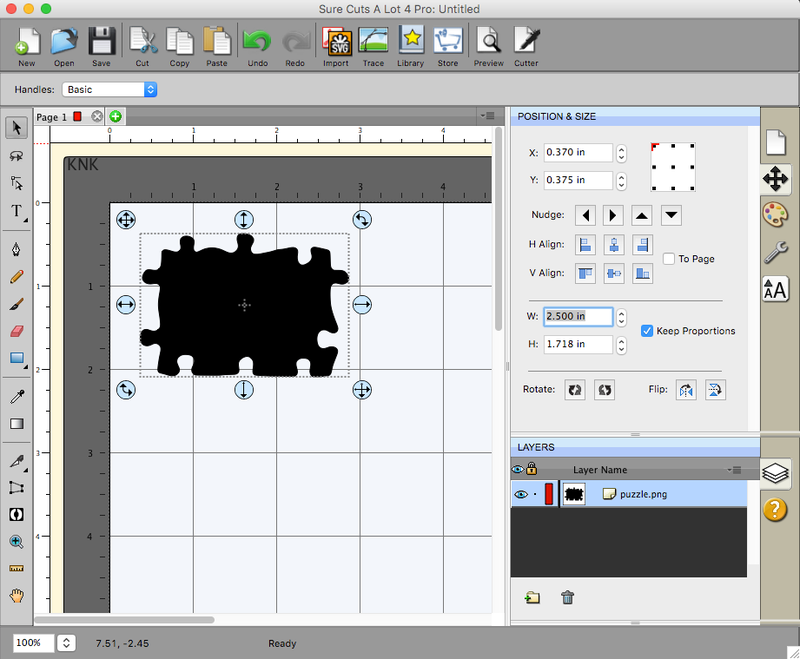 Use software like Sure Cuts a Lot, Make the Cut, Inkscape, etc. to pixel trace this image and generate an SVG file of the shape. 5. 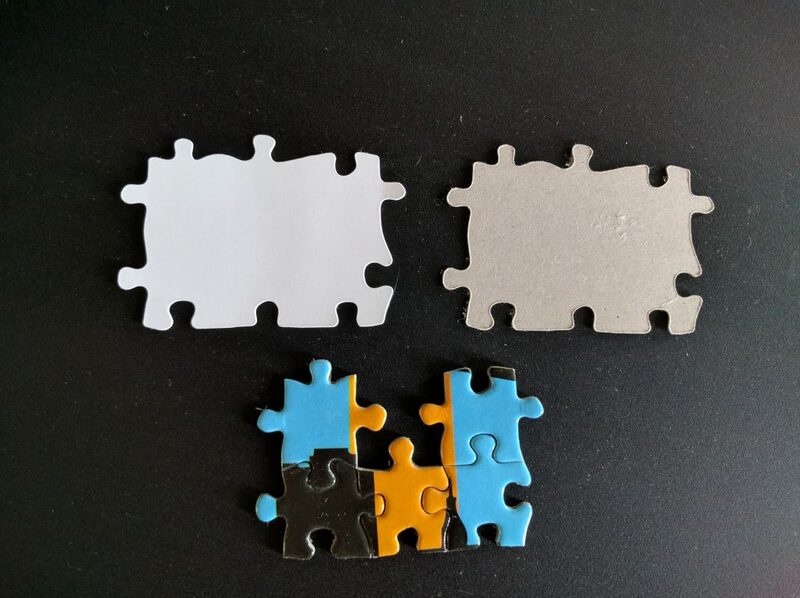 Measure the width of the gap of your missing puzzle piece and scale your shape to match it. For me, it’s a 2.5″ width. 6. 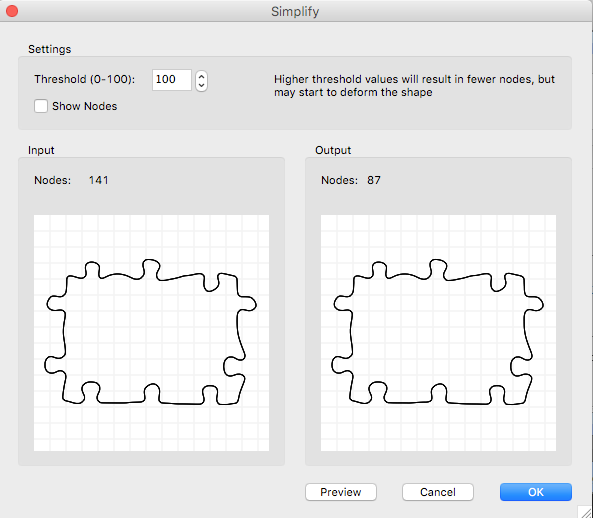 Simply your path to minimize the number of nodes and get a cleaner cut. Watch your preview to ensure the shape doesn’t distort because of your settings! 7. Export the selection as an SVG file and cut it! You can glue together layers of chipboard, cardstock, etc. 8. 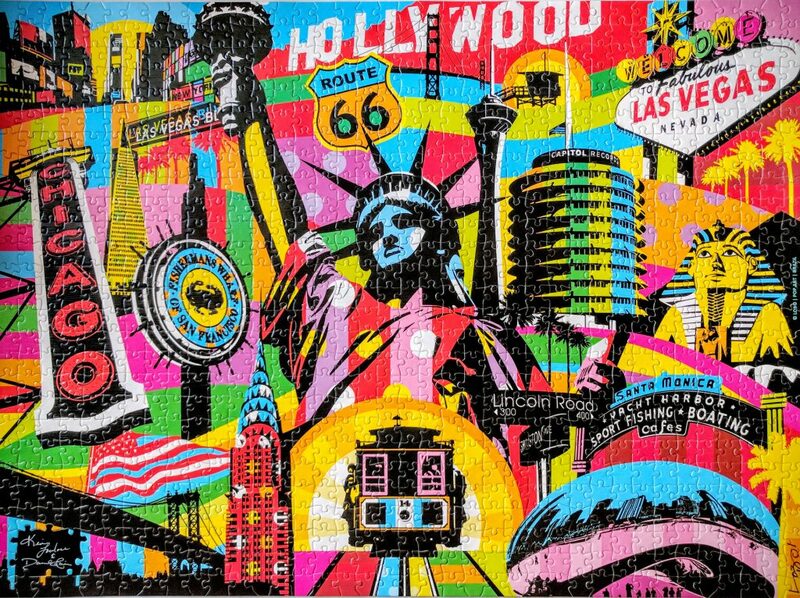 Place your finished piece or pieces in the puzzle and enjoy the sense of accomplishment and the smile on your puzzle partner’s face! You’re so damn smart!!!!! I love u!!! My force is waiting in storage until our house is finished being built. I’d like to stock up on the extra!s I need to buy. What other tools do I need to order? Besides the dremal bit? Any other bits I should get?